A custom magnet is the perfect way to keep your logo displayed everyday! Fun for home, office, or school use, this Full Color Bic Original Custom Mood Meter is perfect for your next direct mail campaign! Available in 3 creative stock designs, this magnet helps you share your mood in an entertaining way. Whether it's the company fridge or the home fridge, a custom magnet will be seen over and over again. An apple custom magnet a day keeps your logo in play! Full Color Round Button Custom Magnet - 3"
Promotional magnets really stick out in people's minds! 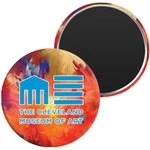 Full Color Round Button Custom Magnet - 1.75"
Take stock of your promotional needs with detachable magnetic words and your business card on this logo magnet. Show how much you care with this heart shaped promotional magnet. This full color house shaped promotional magnet is perfect for real estate and construction companies. Your logo will be at home anywhere with this house shaped promotional magnet. Your full color logo will be at home in the middle of this real estate themed promotional magnet with detachable word magnets. A fun custom magnet in the shape of a star, that will be seen over & over again. Promote your next summer event with these Full Color Specialty Shaped Logo Magnets! This magnet will be eye-catching no matter where it is hung. A fun and stylish specialty promo magnet in the shape of a teddy bear. Ring up sales with this logo magnet in the shape of a telephone. This full color logo magnet is a colorful way to promote awareness for your cause. Your logo will shine all day and night with these glow in the dark custom magnets. Ring in higher profits with this promotional magnet in the shape of a telephone. A specialty promo magnet in the shape of a service van. A useful promotional magnet that will give your logo maximum exposure. This promo magnet will illuminate fridges and file cabinets all day and night. The doctor, and your logo, are in, with this rectangular promo magnet with a stethoscope shape attached. Create an eye-catching design with your branding on this Square Custom Magnet! These are perfect for trade show giveaways, store openings, and more! Give the gift of creativity with these detachable Promotional Message Magnets that promote your business card. With this promotional magnet your logo will be visible and colorful. A full color logo magnet that's right on target. Give your next marketing campaign a helping hand with this Full Color Specialty Shaped Logo Magnet! This rectangular promotional magnet will stick out anywhere. This colorful, fun, and unique logo magnet inspires with words of health wisdom. Take the right angle for promoting your brand with this square shaped promotional magnet. These T-shirt shaped promotional magnets is the perfect billboard for your logo and message. This logo magnet is your prescription for brand awareness. These flexible logo magnets are a great way to promote businesses or events. Promotional flexible refrigerator magnets from ePromos are your chance to have a cool promotion! Refrigerator magnets make great employee gifts and trade show giveaways. If you want to add a personal touch, ePromos can custom imprint your company name and corporate logo on all promotional magnets. It's a great way to raise brand awareness! We can print custom magnets with your organization's name and business information. We carry products for any business and can put your logo on almost any promotional item.